PRISMA: Piloting Responsible Research Innovation in Industry: a roadmap for tranSforMAtive technologies’. The faculty of TPM received a European research grant for PRISMA, a Responsible Research Innovation (RRI) project conducted together with colleagues from the faculty of Applied Sciences and other international universities and institutes. There is now only limited experience with RRI in industry and there is also limited evidence of the added value of opening up the innovation process in industry for social engagement and gender considerations.In the PRISMA project, eight RRI pilot projects will be carried out in a real-world industry context. 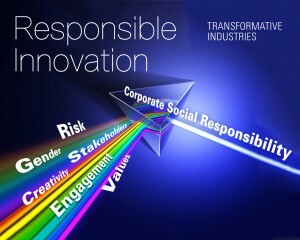 To establish the added value of the RRI approach and the gender dimension in and for industry, the team will assess pilot projects on a number of product and process RRI dimensions and compare the score of the pilots on the relevant RRI dimensions with the score of similar projects in the same companies in which the RRI approach has not been followed. The team will focus on implementing RRI for some of the major technological challenges in the EU including nanotechnology, synthetic biology, Internet of Things and self-driving or automated cars. CANVAS: Constructing an Alliance for Value-driven Cybersecurity. Disseminate the insights gained through various means such as briefing packages for policy stakeholders and a Massive Open Online Course (MOOC). TU Delft will lead the Knowledge Consolidation Ethics work package due to its internationally recognised activities in the area of “responsible innovation” and its renowned contributions to the field of ethics and ICT. Both projects include online education & MOOCs to disseminate the results of the project.